Abu Ja'far Muhammad ibn Musa al-Khwarizmi lived in Baghdad, around 780 to 850 CE (or AD). He was one of the first to write about algebra (using words, not letters). Around 825 he wrote the book "Hisab Al-jabr w’al-muqabala", from which we get the word algebra (meaning 'restoration of broken parts'). This book included many word problems, especially dealing with inheritance. The Hindu-Arabic system was much easier to use when performing mathematical operations, since it is a base-10 system. Ever tried to multiply using Roman numerals...? 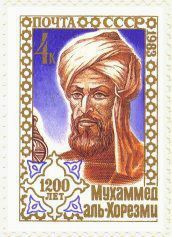 This Islamic mathematician was also instrumental in encouraging the use of the number 0 as a place holder. For example, the "0" in the number 105 indicates there are no multiples of 10 in this number - the 0 is just separating the "1" (for undreds) and the "5" (for 1's). Al-Khwarizmi was a scholar at the House of Wisdom in Baghdad. This group was interested in re-engaging with the brilliant work of the ancient Greeks, which had been lost and almost forgotten about, for centuries. Apart from translating the classic Greek texts, they published their own research on algebra, geometry and astronomy. The scholars weren't simply producing academic works. They were trying to solve the problems of the day involving lawsuits, trade, measurement and inheritance. The algebra presented in the book "Hisab Al-jabr w’al-muqabala" used words for variables, so it was not as convenient as the algebra we use today. "Al-jabr" means "completion" and "al-muqabala" means "balancing". His aim was to solve linear or quadratic equations by removing negatives using a process of balancing both sides of an equation. This is the same as what we do in algebra today. From al-Khwarizmi's name came the word "algorithm".